2015 KH162: A distant icy world past Pluto. Artist depiction of a small world far, far from the warming Sun. Astronomers have found an interesting new world orbiting the Sun—no, it’s not Planet Nine, but it’s still cool. 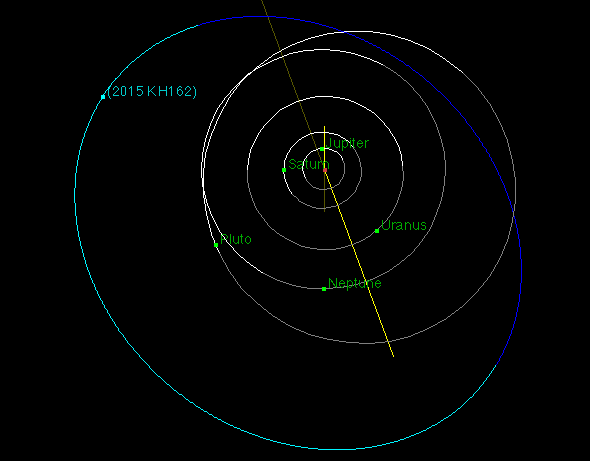 Called 2015 KH162, it’s a small(ish) object orbiting the Sun far, far past Pluto. It’s not clear how big it is. You can figure out an object’s size if you know how far away it is (which we do) and how reflective it is, a number called its albedo. If it’s shiny it can be small and still look bright; if it’s dark it has to be much bigger to appear as bright. Albedos can be difficult to determine, but given the albedos of other objects in that part of the solar system KH162 could be as small as 500 kilometers across, or as large as 1,000. Either way, it’s much smaller even than Pluto (which, at 2,300 kilometers, is smaller than our own Moon). It’s probably even smaller than Pluto’s moon Charon (which is 1,270 kilometers in diameter). Still, given that it’s almost certainly mostly ice and rock, it’s big enough that it’s probably close to spherical. Judging just from its brightness, it’s probably in the Top 20 objects by size we know of so far out past Neptune. Not huge, but not just a bit of fluff, either. The orbit of KH162 keeps it well away from the Sun. The Earth’s orbit is too small to even show on this scale. The orbit is interesting. KH162 is on a fairly elliptical orbit that’s tilted quite a bit to the plane of the solar system (the major planets all orbit the Sun in essentially the same plane; if you looked at the solar system from the side it would look flat, like a DVD seen on edge). It gets as far from the Sun as 12.5 billion km, but at its closest it’s a mere 6.2 billion km out. That’s very interesting; that means sometimes it’s closer to the Sun than Pluto gets! Not that they’ll ever collide. 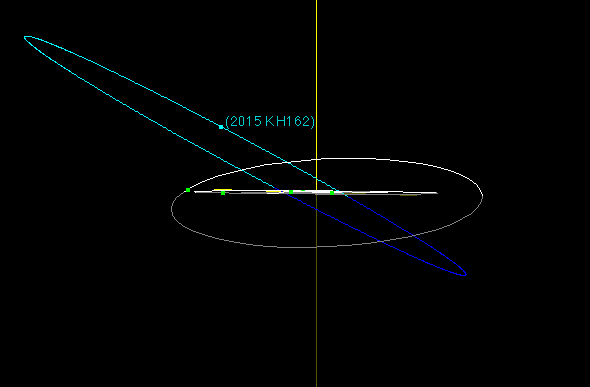 KH162’s orbit is tipped enough that their paths don’t physically cross. Seen from the side, the solar system planets’ orbits form a flat disk. You can see how tilted KH162’s orbit is. Pluto’s (in white/gray), too. It was first observed using a telescope on Mauna Kea in Hawaii back in May 2015. It was seen again many times over the next few months, enough times to establish an orbit — an object has to be observed many times to nail down the orbital shape, and KH162 moves so slowly that this took a while. It takes 489.6 years to orbit the Sun once. I noticed something right away about KH162: Its orbital period is almost exactly three times the period of Neptune’s orbit (489.6 versus 164.8 years). That sort of simple ratio of orbital periods is called a resonance. This is certainly not a coincidence; resonances are common and usually the result of gravitational interactions. I talked with astronomer David Nesvorny, who studies how small objects out past Neptune interact with it, and he directed me to a paper he just published. 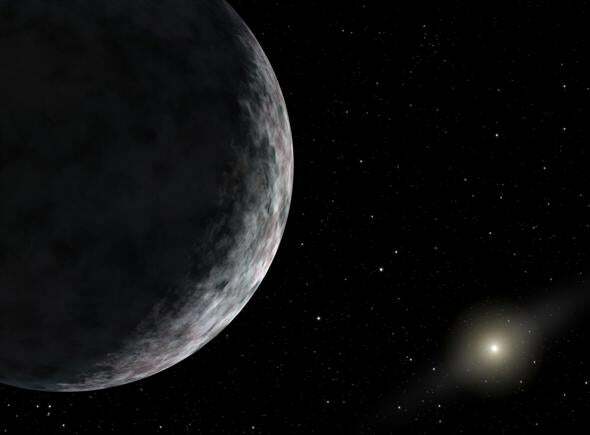 The details are complex, but the bottom line is that billions of years ago, there may have been lots of Pluto-size objects past Neptune as well as countless smaller ones. If so, as Neptune scattered the Pluto-size objects one by one, the big planet got a bit of a kick, too. Every time that happened it would have moved a tiny amount in its orbit (what we call migration). Eventually it kicked all those objects away, leaving just a couple (which is what we see, specifically Pluto and Eris). Due to the weird nature of orbital mechanics, many of the smaller objects in certain orbits would’ve been spared. This includes the 3:1 resonance; the orbit KH162 is in! So it may be a survivor of Neptune’s wrath, in a lucky orbit that kept it away from the much bigger and more persuasive planet. How about that? On the “how amazed should I be by this discovery?” scale I’d rate it somewhere around “hey, that’s pretty cool!” It’s pretty interesting. In fact, I’d say its discovery is important for two reasons. One is that we don’t know of many objects this size that far out—they’re faint, and really hard to detect. Every one we find is an important addition to the inventory, and tells us more about how the early solar system behaved. But another reason this excites me is that it shows that there still are relatively massive objects out there left to be found. The scattered disk extends far, far past KH162, so there could be many bigger objects out in that region that are simply too faint to be found. Yet. It’s a big sky, and we’ve only been looking for these worlds for a few years. KH162 certainly has a lot of siblings (including bigger siblings), and I have no doubt we’ll find many more. Tip o’ the dew shield to Karl Battams and Charles Bell.